To encourage all professionals involved in maternity care to implement process improvements that support, promote and facilitate physiologic birththrough dissemination of actionable resources, case studies and examples. Click to download a handy 2 page PDF handout that can be shared with others to introduce them to the BirthTOOLS.org website and its resources. The American College of Nurse-Midwives (ACNM) has been working collaboratively in various capacities to promote physiologic birth as the standard of maternity care in the United States. As part of a strategic initiative, various multi-stakeholder groups have been developing resources to expand the understanding of the value of physiologic birth among 3 key groups: women and families; maternity care providers; and quality assurance/improvement leaders and health care policy makers. A toolkit to promote care practices that support physiologic birth has been developed for use by maternity care professionals. With leadership from ACNM and consultation from Childbirth Connection a multi-stakeholder committee comprised of representatives from the Association of Women’s Health, Obstetric and Neonatal Nurses, National Association of Certified Professional Midwives and Lamaze International along launched BirthTOOLS (Tools to Optimize Outcomes of Labor Safely) found at www.BirthTOOLS.org. 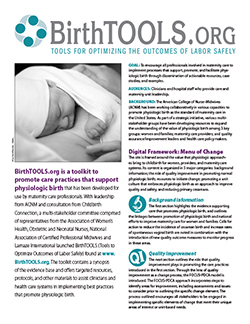 The toolkit contains a synopsis of the evidence base and offers targeted resources, protocols and other materials to assist clinicians and health care systems in implementing best practices that promote physiologic birth. The site is framed around the value that physiologic approaches bring to childbirth for women, providers, and maternity care systems. Its content is organized in 4 major categories: background information; the role of quality improvement in promoting normal physiologic birth; resources to initiate change; and promoting a unit culture that embraces physiologic birth as an approach to improve quality and safety. The first section highlights the evidence supporting care that promotes physiologic birth, and outlines the linkages between promotion of physiologic birth and national efforts to improve maternity care for women and families. Calls for action to reduce the incidence of cesarean birth and increase rates of spontaneous vaginal birth are noted in combination with the introduction of new quality outcome measures to monitor progress in these areas. The next section outlines the role that quality improvement plays in promoting the care practices introduced in the first section. Through the lens of quality improvement as a change process, the FOCUS-PDCA model is introduced. The FOCUS-PDCA approach incorporates steps to identify areas for improvement, including assessments and issues to consider prior to outlining the specific change element. The process outlined encourages all stakeholders to be engaged in implementing specific elements of change that meet their unique areas of interest or unit-based needs. Each element includes an introduction to the evidence base supporting the change, a review of key outcomes that result from the change, and a collection of resources that can assist maternity care professionals in implementing the change. Resources include model policies, guidelines from national organizations, algorithms, staff education materials, and a list of references to support the information provided in the introduction of the section. For example, specific resources under the section “Comfort and Coping” include methods to assess a woman’s comfort, an evidence-based algorithm that guides the process, and a selection of interventions for the maternity care professional to use in supporting a woman’s comfort and coping in labor. Audit tools and exemplar policies are included in these sections and can be utilized as templates for other users. The section on unit culture outlines opportunities to promote a maternity care environment where all members of the health care team are working together to promote quality and safety with an emphasis on the use of physiologic approaches to childbirth as a key strategy to reach improvement goals. Resources include team member assessments, comprehensive approaches to whole scale change and the value of interdisciplinary care, shared decision making, and ongoing assessment of quality improvement initiatives. In spring 2015, the ACNM launched the Healthy Birth Initiative: Reducing Primary Cesareans Project. This initiative, funded by the Transforming Birth Fund, builds on the prior work of the Healthy Birth Initiative by offering unique opportunities for maternity care professionals and health systems to initiate action steps— called bundles. When implemented, these bundles prompt system change that is aimed at reducing the incidence of primary cesarean births in the United States, which has risen alarmingly without associated improvements in health outcomes for mothers and babies. These bundles are available on the BirthTOOLS site for implementation by all maternity care units. The “TOOL BOX” can be searched by the overall content area, such as “Comfort and Coping”; by type of resource (e.g., guideline, staff education, position statements); or by key word or phrase, such as “skin to skin.” This function allows users to more efficiently locate the unique resources they need to support their change process or to augment the processes they already have in place to maintain a specific care practice. A unique feature of the site is “Stories of Improvement,” which includes case studies highlighting institutions, practices, or individuals that have successfully implemented some of the care practice changes advocated by the consensus statement. For example, one story of improvement focuses on how a health system was able to implement a policy to support intermittent auscultation of fetal heart tones. Another case highlights a health system’s successful efforts in introducing nitrous oxide as an alternative comfort measure. Taken together, these valuable resources on the BirthTOOLS site have been compiled and collated to make it easy for maternity care professionals to implement the changes that are needed to improve spontaneous birth rates in the United States. The following individuals have contributed to the development of specific text for use on this site.